I had a glass sugar bowl that had a stainless steel spoon and lid. 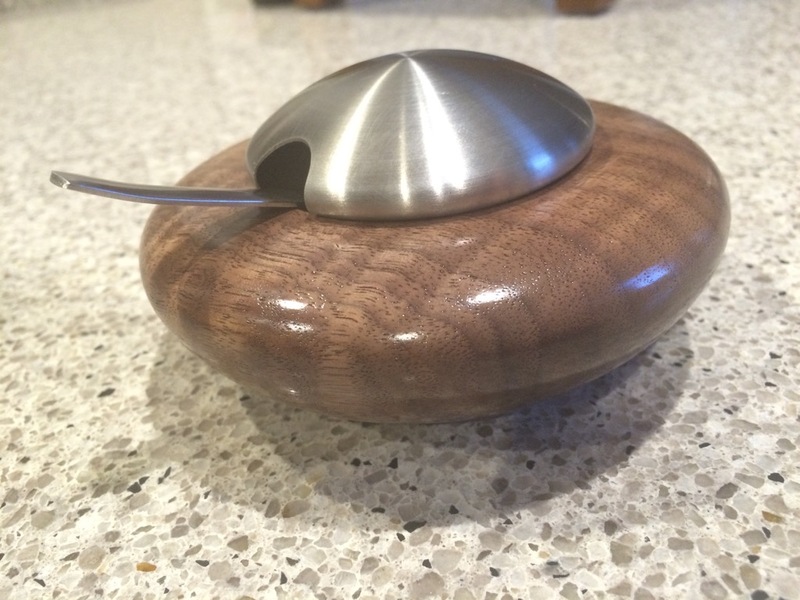 Over time, the rim of the bowl got chipped and sharp so decided to get rid of the glass, but the lid and spoon looked like they’d look very nice with Walnut. The major diameter is about 4″. I’ll let you be the judge. Not much to say about this one. I hollowed it out to a wall thickness of around 3/16″ to 1/4″, left the bottom a little thicker. The finish is General Finishes Wood Turners Finish, which was very user-friendly. I didn’t put any finish on the inside. This finish didn’t pop the grain quite as deeply as a lacquer or shellac finish might have, but it also doesn’t seem to have added much yellow to the colour, which is good because yellow isn’t a very popular colour in my household. This entry was posted in Projects, Turning, Woodworking. Bookmark the permalink.